← Congratulations to Rabbi Bonnie Lawrence featured in the #1 International Bestseller, Messages That Matter! 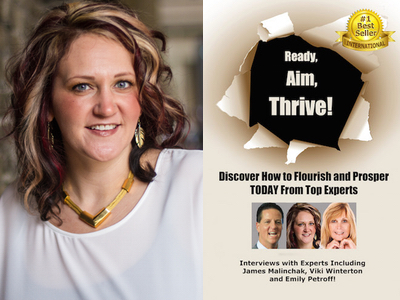 Emily Petroff is featured in Expert Insights’ #1 International Bestseller Ready, Aim, Thrive! A transformational leader focused on employee empowerment and challenging the traditional leadership hypotheses, Emily Petroff has spent over 10 years working in a variety of industries. Emily, President of Evolve, has direct oversight operations which encompass coaching both personal and professional relationships. Emily’s focus on relationships, trust, and rapport in a highly “emotional” field has allowed her to utilize her strengths to implement rapid change, and improve relationship engagement. She is no stranger to the pitfalls of life, relationships, parenting, and self-confidence. Her dedication to her own ongoing personal growth and development is a testament to her success and the success of her clients in health, business, and relationships.